In the aftermath of the January 28 and 29 second Summit of the Community of Latin American and Caribbean States (CELAC), in Havana, Cuba, the Caribbean Community (CARICOM) as a group and its member states individually, must undertake a critical reflection on how they stretch into more ambitious integration enterprises even as their own house is in seeming disarray. Opening of Mariel Port, Cuba, January 27, 2014. The terminal was constructed by Brazilian company Odebrecht with a total investment of US$957 million. The issues of the Dominican Republic’s withdrawal of citizenship of descendants of Haitians and CARICOM’s embrace of pursuing an agenda of reparations for the African diaspora from the successors of European beneficiaries of the trans-Atlantic slave trade raised at the summit by CARICOM chairman, St Vincent and the Grenadines’ Prime Minister Ralph Gonsalves, got none of the respect the regional delegation thought they should. And if CELAC’s agenda of economic integration and cooperation is predicated on a model of planned and rational development—the type generally espoused by socialist oriented polities—then the invitation to Jamaica’s Prime Minister Portia Simpson Miller, to the formal opening of a revamped port of Mariel as a regional transshipment hub, might have been insensitive since Jamaica is also contemplating making itself the regional logistics/transshipment hub. The call, therefore, by Edmund Bartlett, Jamaica’s Labour Party opposition spokesman on foreign affairs and foreign trade, for Simpson Miller to report to the nation on the outcome of the CELAC summit, to which she led a delegation, may be at once tongue in cheek and incisively cutting. But more anon. Gonsalves’ pleas for Dominican born people of Haitian ancestry and support for reparations didn’t fall on deaf ears. They fell on resistant ears. “[W]e call on our entire CELAC community to formally join its Caribbean brothers and sisters in demanding reparations as an agenda for us all to advance, concretize and execute,” declared Gonsalves. “The European nations that engaged in conquest, settlement, genocide and slavery in our Caribbean must provide the reparatory resources required to repair the contemporary legacy of their historic wrongs,” he added before launching into what he saw as the related issue of the depriving Dominican-born persons of their nationality. “Mr. President, this brings me to a painful, but necessary discussion of an issue that goes to the heart of our dream to advance and further the integration and ennoblement of Latin America and the Caribbean through CELAC. That issue is the 23rd September 2013 decision of the Constitutional Court of the Dominican Republic to deprive arbitrarily hundreds of thousands of Dominican-born persons of their nationality. Most of those so deprived, and faced with forced expulsion from the land of their birth, are of Haitian descent and are identified on the basis of their skin color and complexion. “CARICOM has issued a joint statement, which correctly and unequivocally condemns the ruling as “abhorrent,” “discriminatory,” and “repugnant”. “CARICOM has also suspended the Dominican Republic’s pending application for membership in our body, and called on other regional and international bodies and institutions to consider ways in which they can convey what must be unanimous international disgust at this attempt to institutionalize discrimination and the deprivation of basic human rights. The only reference to the Dominican Republic in the final communique at the end of the summit was recognition that it had offered to host the next CELAC meeting in 2016. Back in Jamaica, opposition spokesman Bartlett didn’t question the size of the delegation nor the cost of the prime minister’s trip, as his party is wont to do amidst the challenging economic climate the country faces and the numerous foreign trips over which the administration has been grilled in recent months. There was not a hint of the usual partisan inspired hostility in the tone of Bartlett’s query announced in a news release issued by his JLP on Monday. Maybe Bartlett was just being peaceable as he asked the summit in Havana’s declaration of the space as a “zone of peace”. “We are calling on the Prime Minister to indicate the backdrop against which this proposed designation was advanced and outline to us what specifically it entails,” Bartlett added. While Bartlett “appreciates and recognizes the significant role organizations like CELAC play, and have the potential to play, in promoting further political and economic cooperation across the region”, one could be forgiven if they overlaid on his statement Cuba’s officially opening, simultaneously with the summit, its Brazilian-funded logistics hub that competes with one proposed for Jamaica reportedly with Chinese funding. It certainly sounds as though the “specific benefits to be derived” was really a subtle query: how will our proposed logistics hub stand up against the more than half a billion dollar (Cuba reports $680 million and the New York Times, $900-million) Mariel expansion on which Cuba is pinning its economic future? Jamaica is equally hoping that the “Chinese development” proposed for a southern pair of near coast islands in an environmentally protected area will be its economic godsend. 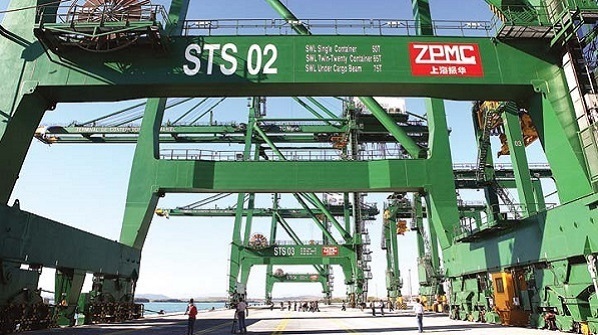 The JLP claims ownership of the idea for a logistics hub and deep water transshipment port to benefit from Panama Canal expansion expected to be completed in 2015 that will allow mega-ships to cross the isthmus. So far the Jamaican government hasn’t said which Chinese state or other investor proposes to build the Goat Islands facility and who will manage it. President of Cuba, Raúl Castro, and Dilma Rousseff, President of Brazil as they inaugurated the Mariel facility while some Latin American and Caribbean leaders, including Jamaica’s PM Portia Simpson Miller, look on. 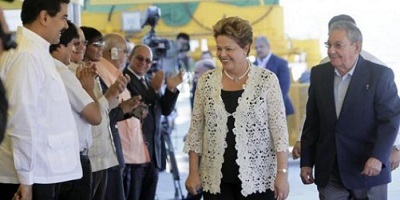 Meanwhile, when Army General Raúl Castro Ruz, President of Cuba, and Dilma Rousseff, President of Brazil inaugurated the first section of a container terminal at Mariel, 45 kilometers west of Havana, both leaders said the state-of-the-art port would lead to a new era of commercial integration, connecting Cuba and the world. Castro is reported as describing the terminal as “a transcendent project for the national economy,” adding that the port and the adjacent 180-square mile development zone, where foreign companies will enjoy tax breaks and other advantages, “are a concrete example of the optimism and confidence with which we Cubans see a socialist and prosperous future” led by greater exports and a stronger economy. Bartlett’s question is as good for CARICOM as for Jamaica. What’s in it for us, this body founded in 2011 by the late Venezuelan President Hugo Chavez and other Latin American and Caribbean leaders as an alternative to the US influenced Organization of American States (OAS) with the aim of increasing regional trade, economic development, and furthering economic cooperation among members in order to defend their growing economies? CELAC is composed of 33 hemispheric countries, including 14 from CARICOM but excluding the US and Canada.